University of Wisconsin–Stout is an art-loving school, but Joseph Haid, associate professor in the Art Education and School of Education programs, noticed we were lacking in a certain area: public art. He plans to remedy this problem with a school mural, hopefully placed in the Memorial Student Center. He proposed the idea of a Stout Mural Project to former Chancellor Sorensen. Sorensen liked the idea enough to give the project full funding and now, Haid is looking to the Stout campus for inspiration. “I want it to be something that represents cultural perspectives that everybody has, that they can share,” said Haid. A planning meeting, held Oct.16, gathered students together to discuss ideas for the mural and to present the history of the idea. The group gathered ideas and hopes to collect images that have potential to become mural material. 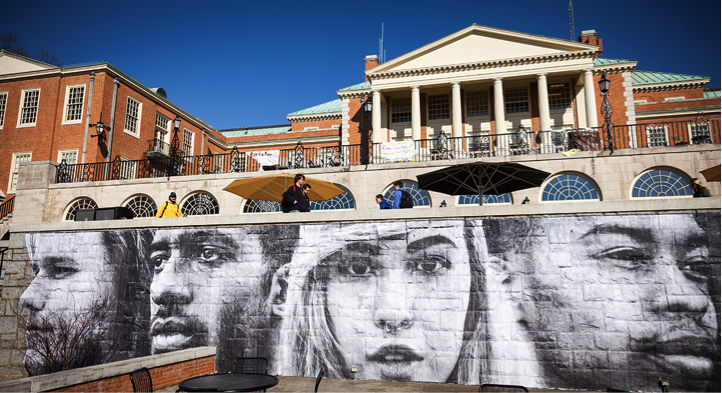 Haid was originally inspired to create the mural after seeing a student photographic mural at Wake Forest College. Haid says this mural, while nice, is not the image he expects for the Stout mural. The image is open to brainstorming. Haid said the image could be abstract or literal, either way, he wants it to represent Stout and make future students feel it represents them as well as past and current students. “We want to encourage uniqueness alongside our differences,” Haid explained. After the meeting, Haid formed a group of students to meet and design final mock-ups. The project is expected to be completed by the end of the semester, but there is no set deadline. There are no certain, final locations for the mural, but Haid hopes to place it somewhere all students will be able to see it frequently, such as the MSC. This will be Stout’s first large scale mural. In 2001, a mural was created for the former MSC, but after the renovation that ended in 2012, the small-scale mural was relocated.